The William Scott Abbott Trust has reached a crucial stage in the restoration of its 18th century Grade II* listed watermill at Sacrewell with the arrival of two skilled millwrights to refurbish and reassemble the mill’s wooden, metal and stone segments to full working condition. The millwrights – Neil Medcalf and Steve Boulton – are from Traditional Millwrights, based at Farlesthorpe in Lincolnshire and will be working on site for two months. They were hired by Stamford based firm Messenger Construction which is responsible for the £1.7 million restoration project at Sacrewell, near Peterborough. The restoration project began last year, using a £1.4 million grant from the Heritage Lottery Fund (HLF) alongside Trust money and will reopen in the summer. The magnificent water wheel is the most recognisable aspect of Sacrewell’s 18th century mill which includes the mill pond, mill house, bakery and mill gardens. The wheel had been carefully disassembled early on in the restoration process, and many of the wooden elements were found to be rotten after 300 years of use. Prior to the arrival of the millwrights, Messenger had been busy working at the back of the mill, casting reinforced concrete walls to stabilise the building and repairing the mill races to help with the flow of water from the mill pond through to the wheel. 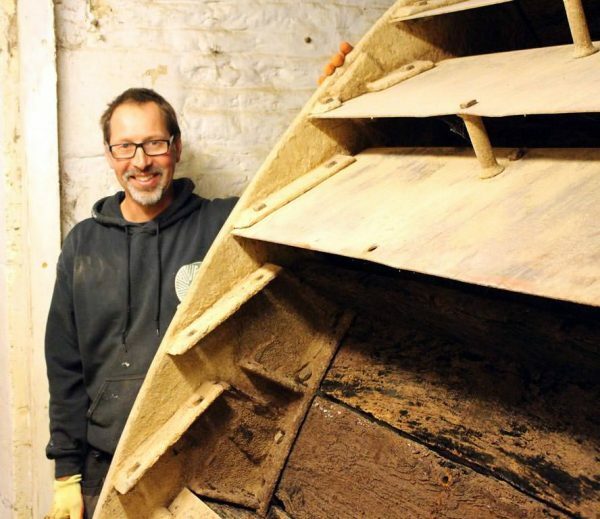 The millwrights’ first job is to replace all of the rotten wood, with carefully selected larch for all of the wheel’s sole boards and buckets. The millwrights will also be stripping and refurbishing the metal on the wheel, restoring the gear cupboard and the large millstones. Mill project officer Jane Harrison said: “Millwrights are much prized traditional tradesmen and we are lucky to have the UK’s foremost mill experts based so close to Sacrewell. Paul Gibbons, managing director of Messenger Construction, said: “Neil and Steve have a wealth of experience repairing, restoring and maintaining historic wind and water mills.